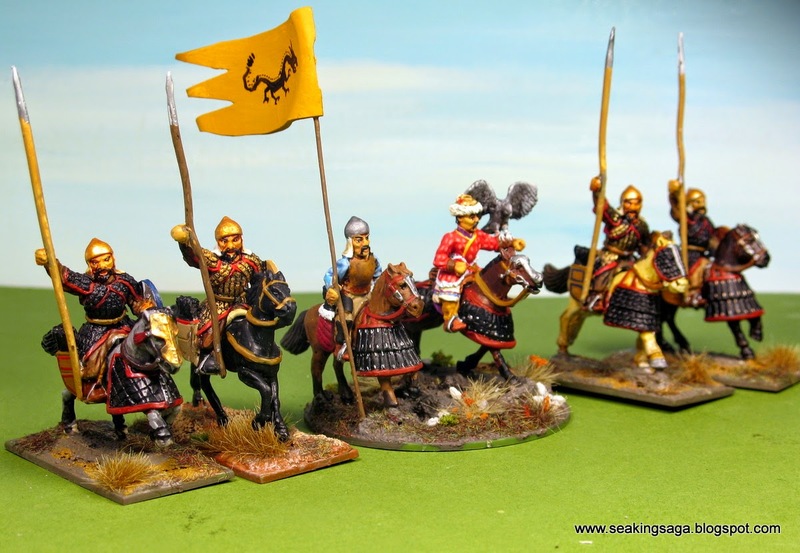 I've seen the Steppe Tribes faction do some pretty nasty stuff in SAGA and have been thinking it would be fun to give them a try. Where to begin, though? "Steppe Nomad" is very broad and nonspecific compared to, say "Norman" or "Welsh." Nonetheless, warfare in late Antiquity and early medieval was similar across the Eurasian plains. It's just a matter of picking which variety of horse warrior you prefer or can find. As it turned out, I came across a sizeable number of Khitan, Chinese and Tibetan figures on closeout this summer. Here is the first completed set from that purchase. The Warlord - This Khitan commander with his falcon is a really nice sculpt. Hunting birds should be seen more in character minis, given their popularity in both Europe and Asia. 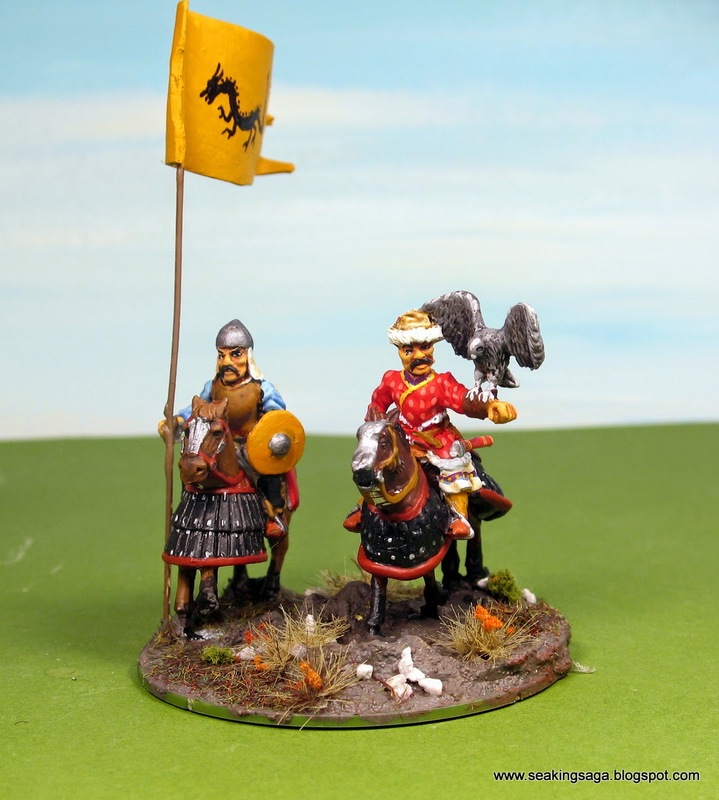 The banner was lifted from the Osprey book on Medieval Chinese Armies. Steppe armies, both pre and post Mongol era used color names for the divisions of their armies. 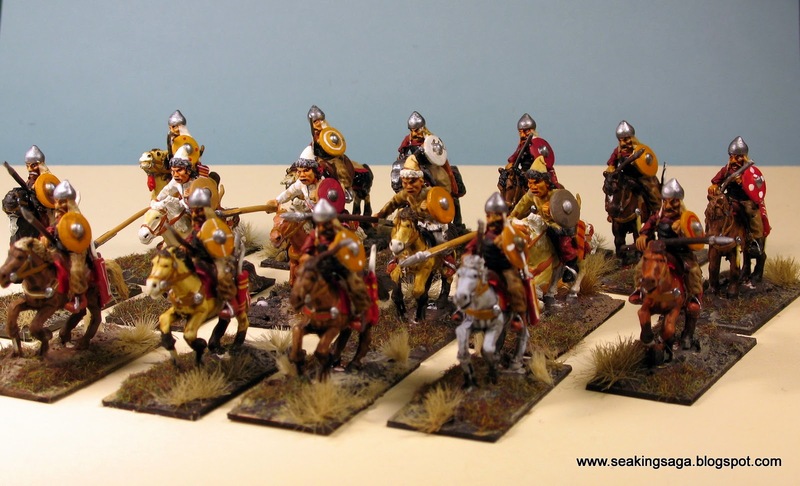 Hearthguard - The Noble Cavalry shown here here are heavy cataphracts. The Khitan's control of northern Chinese towns gave them access to artisans and markets. With this, their weaponry and armor was of better quality than most steppe armies. Warriors -or Ordo, were free warriors who served for honor, status and plunder. They were expected to provide their own horses and weaponry. 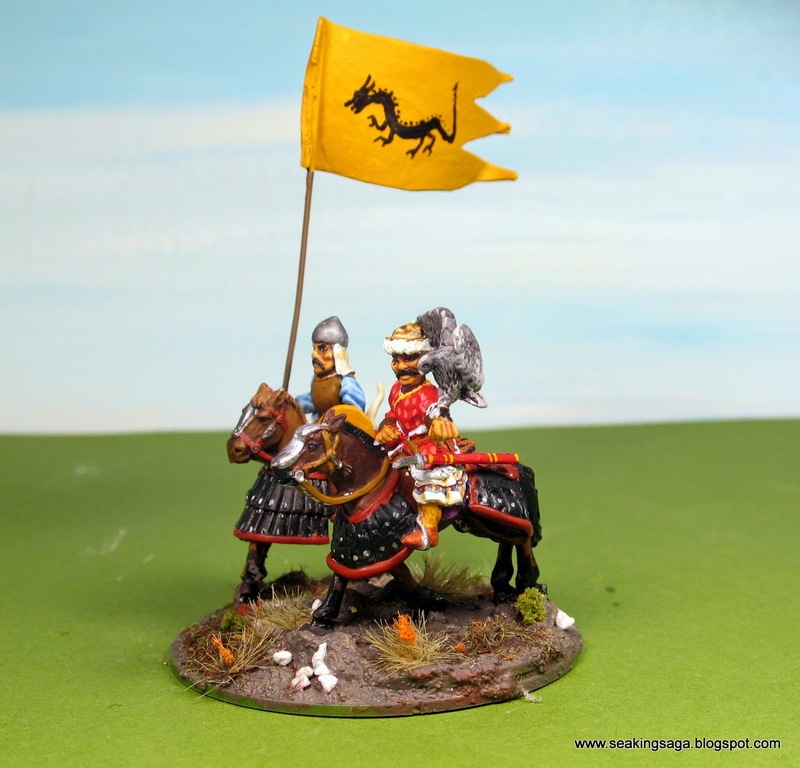 Here are 3 points of light horse I've posted before. They are a mix of Khitan and Jurchen warriors from Essex. Levy - for the Khitans, skirmishing troops were drawn from tribal archers to Chinese and other conscripts. 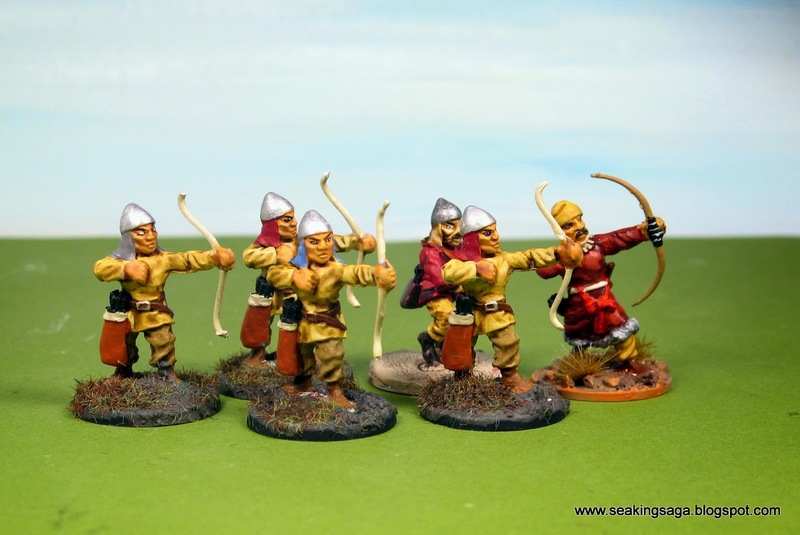 These six representative archer figures are a mix of Khitan, Chinese and Tibetan ranges. This is the first of three Asian forces I'm putting together for SAGA. No custom battle boards this time, because I will use existing battle boards that are most analagous. The Khitans will obviously use the Steppe Tribes board, and I have some ideas about China and Tibet. The goal is the end of the year. Later this week, more Vikings! Nicely done! Love the Warlord base build up, and the Warlord with hunting bird is cool.